Nokia X5 (also known as Nokia X5-01) is an excellent music-oriented smartphone with awesome messaging and social networking tools. It is certainly targeted at youth of India as evident from its looks and features. Announced sometime back at Nokia event at Singapore, Nokia X5 (the successor of the Nokia X5) has now launched in India at a price tag of Rs.9500. It is an unusually shaped mobile phone. Nokia X5-01 is a squarish vertical slider that debuts in India in bold shades viz. Yellow Green, Purple, Pink, Azure and Graphite Black. 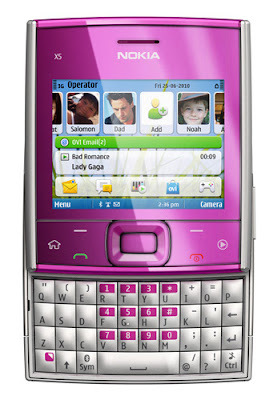 Its stylish looks are augmented with its full QWERTY keyboard and its most significant highlight is its Symbian S60 3rd edition operating system. Nokia X5-01 has a 5 MP camera with LED flash for excellent image quality even in the dark. Its 2.36-inches display with QVGA resolution is simply excellent and so are the most advanced connectivity features of this smartphone. There is 3.5G HSDPA, Wi-Fi, Bluetooth 2.0+EDR and high speed microUSB 2.0 support. Then there is 3.5mm audio jack and loudspeakers for excellent sound quality. The clever new gestures let users spin the phone to jump to a random track and change tracks or send text messages. The phone packs in 128MB of RAM, and 200MB of internal storage. The 200 MB of internal memory which can be expanded up to 32GB using microSD card (2GB card is included in the box). There are music packages via Ovi Music enabled on this phone that is supported on quad-band GSM network. 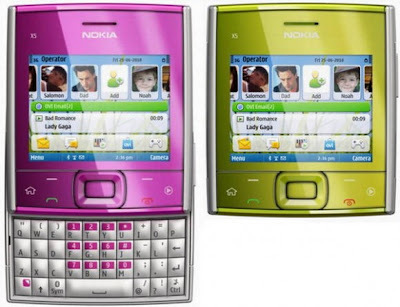 Nokia X5-01 supports popular social networking services viz. Facebook, Twitter, Hi5, and MySpace and also popular Instant Messengers and multiple email accounts. Additional features include uPnP technology. Nokia X5-01 has landed in the Indian handset market at a price of Rs.9500. This is looking of course a great mobile with amazing features like 5 mega pixel camera enough storage and other astonishing features which makes this mobile apart from others.